How to Compact Concrete in Sloping Surface? Dear reader usually we have cast concrete in either vertical or horizontal or combination of both. But in some case we have to establish a slopping surfaces for concrete. We will learn how to compact or consolidate concrete in slopping surfaces. It is very common in building construction that providing slope in roof and toilet/ bathroom etc. where water has to guide to certain direction. In pavement construction we also have to provide slope to facilitate vehicle movement and also to allow run off of water. We know water is the main enemy of pavement either of concrete or asphalt. But the slopes we have discussed are commonly of very mild slope, exception in highway pavement there may have steep slope in special cases. In mid slopes the normal process of consolidation concrete is enough; but in steep slope like an embankment or any other slope having 1:4 or steeper special consideration is required. Dear reader 1:4 means 1 vertical to 4 horizontal. 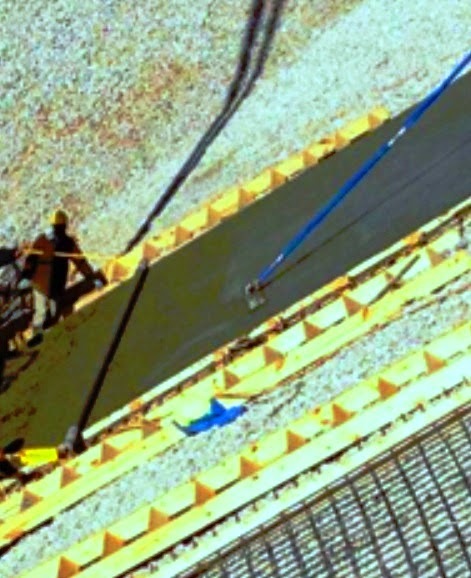 In this case slip form screed or temporary-holding form is required, which prevent flow or sag of concrete mass during vibration. This facilitates consolidation by eliminating strike off top surface. To avoid surface blemishes before reaching final set holding form is removed carefully and worked by hand. But when sloping forms have difficulty in removing before setting, they are removed just after filling to avoid blemishes. What is the Consequence of Concrete Form Leakage?